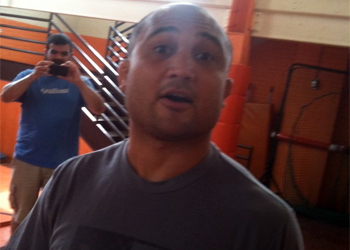 Although UFC president Dana White has already professed the new main event for UFC 137 between BJ Penn (Pictured) and Nick Diaz will remain a three round affair, Cesar Gracie, Diaz’s longtime manager, is emphatically pushing for their welterweight tussle to potentially go 25 minutes. The chances of Penn accepting a five round fight on 11-days notice likely ranges between the slim-to-none range. Courtesy of Diaz’s triathlon-supported cardio, the 28-year-old would have no issues with potentially fighting another 10 minutes. Although Penn claims to have kicked his training up to unprecedented levels, his conditioning has always been his biggest question mark. Knowing they might be able to exploit Penn’s biggest weakness, Gracie continued to put the heat on the Hawaiian and left the ball in his court. “Dana is good with it,” Gracie added. “We’ve agreed to it. If BJ agrees to it, we’ll make it happen. UFC 137 takes place October 29th inside the Mandalay Bay Events Center in Las Vegas, Nevada. Their critical welterweight scrap now headlines the pay-per-view broadcast.